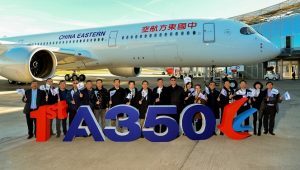 Australia is likely to see the arrival of China Eastern’s new A350-900 aircraft early next year – Australian routes are being evaluated and China Eastern signed a Memorandum of Understanding (MoU) with New South Wales last month. The Shanghai-based carrier became the latest operator of the efficient twin-engine widebody plane on Friday. Today, the A350-900 is due to make its maiden flight from Shanghai Hongqiao International Airport to Beijing Capital International Airport. 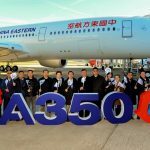 China Eastern now operates an Airbus fleet of 356 aircraft, making it the largest Airbus operator in Asia and second largest in the world. China Eastern is keen to attract more premium long-haul intercontinental business. It’s set to receive another A350-900 this year and 18 more by 2022, according to China Eastern chairman, Liu Shaoyong. The carrier’s fleet currently stands at 700 aircraft. Just for comparison, the Qantas fleet is currently 132 aircraft with 14 on order. China Eastern’s A350-900 features a modern and comfortable four-class cabin layout of 288 seats: four first, 36 business, 32 premium economy and 216 economy. The A350-900 and the A350-1000, and derivatives, are the longest-range airliners in operation, with a range capability of up to 9700 nautical miles (17,964 kilometres). The distance from Shanghai to Sydney is a mere 7835 kilometres. The A350 XWB features the latest aerodynamic design, carbon fibre fuselage and wings, plus new fuel-efficient Rolls-Royce engines. Together, these latest technologies translate into unrivalled levels of operational efficiency, with a 25% reduction in fuel burn and emissions. China Eastern vice president Tang Bing says the aircraft will introduce China Eastern’smsignature premium business class “Air Living Room”, with new seats, the airline’s largest in-flight touch screen, a new generation in-flight entertainment system, full function bar, optimized cabin scene lighting, NFC (near-field communication) reader for in-flight shopping and a Bluetooth earphone module. A newly minted deal between New South Wales and China Eastern Airlines, signed last month, will involve marketing campaigns, media familiarisations and new itineraries to drive visits to Sydney and regional NSW from seven Chinese cities, including Shanghai, Beijing, Hangzhou, Nanjing, Xi’an, Wuhan and Kunming.